The VersaMist is great for cooling work areas, special events, patios, or sidelines, when limited electricity and no running water is available. 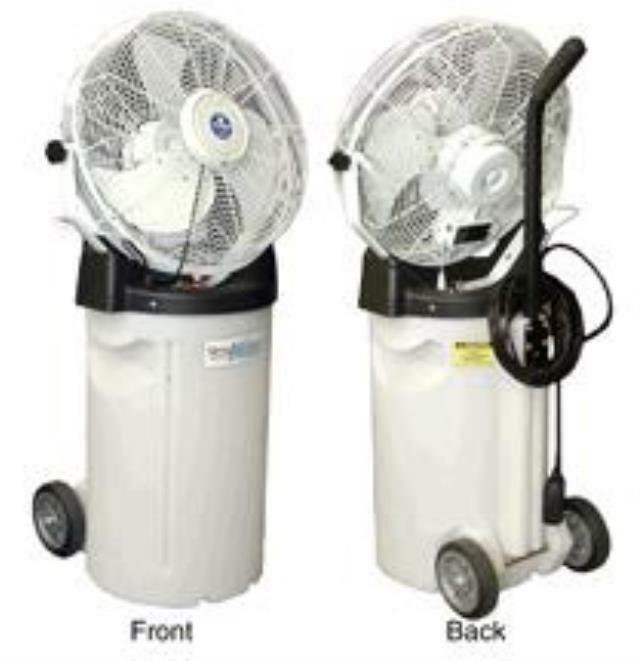 Includes a 10 gallon/5-hour tank capacity, a 3-speed, outdoor rated fan, the choice of mist plus fan or fan only cooling, and safety features including GFI and tip-switch disconnect. built-in rubber wheels and a retractable pull handle for easy transport. Heat can be a major problem on many job sites, resulting in worker fatigue, low morale, decreased productivity and the risk of heat stress. Schaefer's VersaMist misting fans are a great way to beat the heat. Rapid mist evaporation cools the air up to 30 F and produces 16,000 BTU/hour (1.4 Tons) of cooling. Portable. Unit comes with its own water reservoir (10 gallons) for up to 5 hours of uninterrupted use and a 25' extension cord to connect to a standard wall outlet. Pump and fan assembly is easily separated from the reservoir for cleaning or storage. * Please call us with any questions about our fan 18 inch versamist misting fan in Hammond LA.